Hey everyone, I just uploaded a new image, can you guys give some feedback on how to improve it? Thanks a lot! 2) There is a bit too much blue-magenta in it for my tastes - I would warm up the color balance a bit. 3) I'd like to see a bit of sunlight bringing some contrast into the foreground - I wonder if shooting a bit earlier or later would catch a few rays of sun on the trees? Luke, thank you so much for your comment! Appreciate it! 1. I actually had the same thought to be lower and have the castle against the sky. But underneath the bridge I was standing on was only a drop into the valley. 2. Awesome! Thanks! I will definitely pull those colors down. 3. That would be nice. But to catch the first sun rays, I would have had to wait pretty long until the sun showed up behind high mountains. By that time the sun wouldn't be low any more and the light would be more harsh. Cold Morning on the Bridge. Nice photo, but I agree with Luke about warming it up. Also, the castle is pretty much in the center of the image, which makes it static. 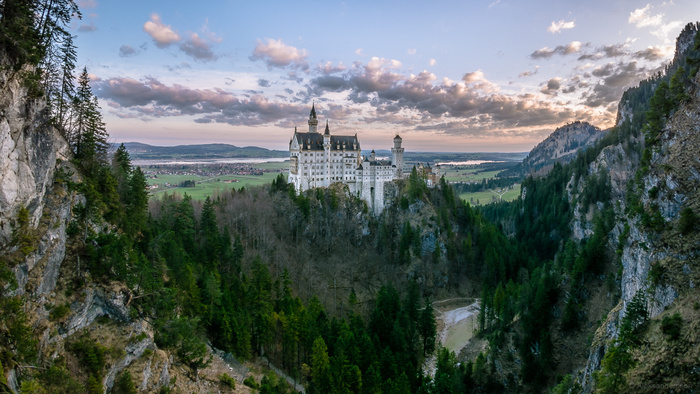 Try moving the castle with the rule of thirds in mind. Zooming in a little would make the castle more imposing. All the castles I've seen have been imposing. I tried to play with the castle position, it's hard to move it cause then I end up with mountain curtain to one side and cut out end on the other. But zooming in sounds like a good idea. I just assumed the more you see, the easier it will be to make you feel being there.. Thanks a lot again, Jeff! There's not a lot going on in the top portion of the picture - it's sort of empty sky. You've obviously cropped it to a wide format, and without knowing what you originally shot, it's hard to give you solid advice, but if I were you (and if it's possible) I would move the horizon up towards the top third of the picture (eliminating some of the empty sky) and showing more of the valley leading up to the castle, to give a sense of how it overlooks the landscape around it. Thanks a lot, Lis! I appreciate the feedback! I'm only using Lightroom but never used the adjustment brush, I guess it's time to learn. I will try to warm up the castle. And yes, I did crop the image. I actually didn't want to see the part below. It's dark and not interesting, I thought maybe cropping it and moving it higher so to say is the way to go. I'll keep editing. Adjustment brushes aren't hard to use - there are hundreds of online tutorials on them and they can make a real difference to your image if there's one spot that you think isn't quite right. Good luck! I notice that the line of the ridge on the left side of the photo forms a nice diagonal down to the bottom edge. If it continues beyond the crop you've shown us here, you might be able to use it to put some interest into the bottom portion of the image. The darkness of the valley might balance nicely against the bright airy feel of the castle. I hope you post an update once you've tweaked it a bit. I'd like to see how it turns out! I will definitely. I quickly tried the adjustment brush and indeed it's pretty simple. Thanks for the tip! I can't believe I never used it. I like the framing of the castle. I do believe though that a different time of day would have yielded a better shot with the castle lighted. I also do not like the magenta cast. A bluish cast perhaps as it would be more appropriate, but definitely not the strong magenta. Just looks to faked. Thanks, Dudley! I really appreciate it!